Steve Moyise, prof of NT at Univ of Chichester, is well-known and respected for his work on the use of the OT in the NT. I recently finished his little work on Jesus and Scripture: Studying the New Testament Use of the Old Testament (Baker, 2011). This book is rather unique because it focuses on Jesus’s use of Scripture. Why is that special? Well, when we look at Romans, we can be pretty confident this is Paul’s use of Scripture (as the author), but we don’t have books authored by Jesus, we have (in this case) the canonical Gospels that attest to Jesus’ use of Scripture. So, Moyise deals with two matters. (1) How do the canonical Gospels represent Jesus’ use of Scripture? Taking the Gospels at face value, one can say how the Matthean Jesus uses Scripture, or the Markan Jesus. Moyise spends a chapter each on the four Gospels and offers helpful summaries of Jesus’ use of Scripture according to the individual Evangelists. For example, Moyise, looking at the Gospel of Mark, concludes: “[Mark] presents Jesus as strongly upholding the law against Pharisaic ‘traditions’, while almost going out of his way to provoke them concerning what can and cannot be done on the Sabbath” (p 32). Moyise finds this tension enigmatic. For Matthew’s account, Moyise finds that his Jesus tends to prioritize moral laws over and sometimes against ritual ones, “but [Matthew’s Jesus] undoubtedly envisages his followers as law-abiding, as he himself was” (p. 50). Luke’s Jesus emphasizes the prophetic aspect of Scripture, especially as it foretells the suffering Messiah himself. Scripture tells a story and Jesus refers to Scripture in such a way as to make himself central and climactic within that story (see pp. 65-66). When it comes to John, Moyise emphasizes that John’s Jesus uses Scripture in many of the same ways as the Synoptics, but the Johannine Jesus seems to read Scripture through a thoroughgoing “Christological” lens. Overall, though, there is much concern among scholars that John provides the least historically accurate portrayal of the use of Scripture of the historical Jesus. (2) A second matter that Moyise deals with has to do with the question – how well do the canonical Gospels actually represent the use of Scripture by the historical Jesus? Moyise divides scholarly opinion into three types: minimalists, moderates, and maximalists. Minimalists, such as Dom Crossan or Geza Vermes, do not have much confidence in the Gospels as historical and accurate accounts, and they find that we can learn almost nothing about Jesus’ use of Scripture from the four evangelists. For these minimalists, the evangelists distorted Jesus’ teachings. Broadly, they perceive that the historical Jesus was not comfortable within normal margins of Torah obedience and Jesus spoke on his own authority and did not use Scripture as part of his teachings. Moyise finds this extreme a bit silly and driven too much by a conspiracy-theory agenda. As for the moderates, like Ed Sanders or James Dunn, it only makes sense that if Jesus was a serious Jew, he must have made some use of Scripture, and it would be unlikely that the early church drew nothing from Jesus’ use of Scripture. Where the moderates separate from the maximalists (the latter being people like Charles Kimball and Richard France) is that the latter would argue that the OT texts have fixed meanings (like Ps 110:1) and that when Jesus applied it to himself, and also the early church, this all comes from the intentions of the ancient OT text to begin with. The maximalists would entertain no level of theological development in the interpretation of OT texts, whether by Jesus or the early church after him. Obviously, Moyise is a “moderate” (see pp. 121). He thinks that Scripture must have been important to Jesus and that the early church did pass this on in the Gospels. However, he is skeptical regarding the maximalist assumption that Jesus said every single thing the evangelists have him say. I really enjoyed reading this book – Moyise is a good writer and he limited the technical jargon, so this work might be useful on a broader level – mission accomplished! 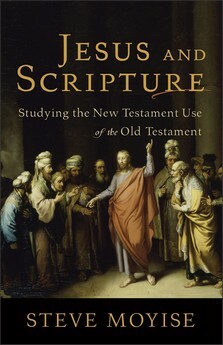 For all who are interested in Jesus studies and/or the use of the OT in the NT, I think you will appreciate this book. Thanks for this post. I love learning about NT use of the OT. Do you have any other resources to recommend in this regard?